Après pratiquement quatre années d'absence voici le retour en force de la section 9. Les studios I.G. éditent une mouture toute fraiche de GITS Solid State Society, cette fois-ci en full 3D (sortie officielle au japon: samedi 26 mars 2011). Re : Ils sont de retour ! The organizers of the Eden of The East event "2011.11.22 Real Ukatsu na Getsuyōbi" announced on Monday that Kenji Kamiyama and Production I.G's Ghost in the Shell: Stand Alone Complex: Solid State Society movie will be converted into stereoscopic 3D. Kamiyama himself is overseeing the conversion, and I.G will also add a newly animated opening sequence. The movie will open in Tokyo's Shinjuku Wald 9 theater and other Japanese theaters on March 26, 2011. The director and the producer Tomohiko Ishii will provide more information and status updates on the production on its official Twitter account. Over 2.3 million copies of the Ghost in the Shell: Stand Alone Complex franchise's home videos releases have been sold in Japan alone. 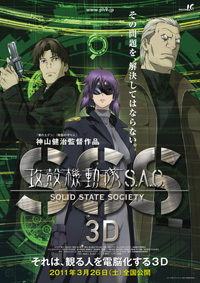 The Solid State Society movie originated as an original video anime (OVA) project, albeit one with a 360-million-yen (about US$4.3-million) budget. La page chez Production I.G. Je doute que ça sorte en salle dans nos contrées, mais le cas échéant faudra prévoir un meeting shirowesque histoire que tous les fans puissent se croiser devant une bière et un bon film. Même si le film ne sort pas ici, en fait.